Gov. Tom Wolf speaks at the Pennsylvania State Association of Township Supervisors conference. The campaign is back on to make the eastern hellbender Pennsylvania’s official state amphibian. For all things hellbender — including its near-miss securing the designation upon encountering a House-championed competitor — check out Marc Levy’s most recent Associated Press story. Lawmakers immediately started looking at Gov. 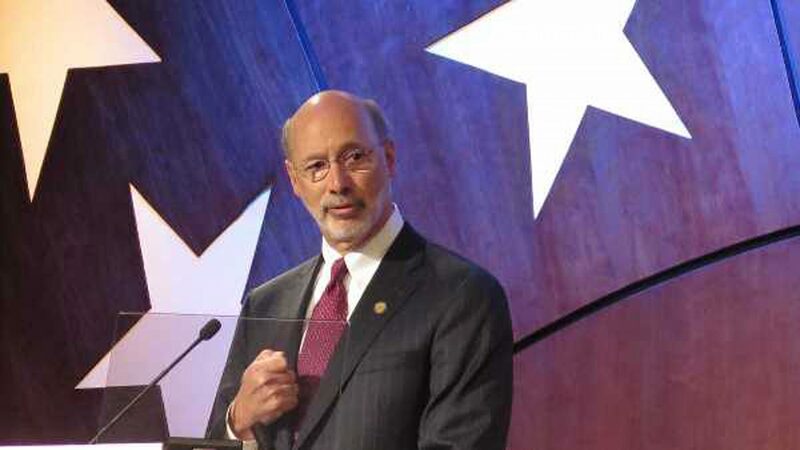 Tom Wolf’s proposed budget with a committee hearing on the minimum wage — except, the expert testimony was a bit one-sided, as Katie Meyer reports for WITF. The state’s Department of Human Services, which oversees mental health and substance abuse programs among other things, is losing a chunk of federal money from its budget. But Wolf has proposed a $400 million increase in state funding, and Transforming Health’s Brett Sholtis checks in on some of the department’s plans. Another key ask from Wolf is his suggested state police coverage payment scale for communities that don’t have their own forces and get PSP services free. I assembled an interactive map with payment amounts; PennLive’s Wallace McKelvey put together a database, if you’d prefer. Insite, Vancouver’s supervised injection facility, provides people with clean injection supplies. The feds are suing nonprofit Safehouse in an attempt to block the organization from opening the would-be first supervised injection site in the country for people with opioid addiction. Safehouse was eyeing sites in Philadelphia and fundraising for the facility, despite warnings against doing so from the DOJ. WHYY’s Bobby Allyn has the story. Pittsburgh cyclists and pedestrians want better-defined public policy regarding self-driving cars, according to a recent survey. Bike Pittsburgh collected info from nearly 800 people, its second such endeavor in recent years. More here from WESA’s Megan Harris. Legislators are trying to change state law to require utilities to purchase some electricity from nuclear sources — a first step toward bailing out Pa.’s nuclear power industry, Marie Cusick reports for StateImpact Pennsylvania.